Nagy, G., Ünnep, R., Zsiros, O., Tokutsu, R., Takizawa, K., Porcar, L., Moyet, L., Petroutsos, D., Garab, G., Finazzi, G., Minagawa, J. (2014) Chloroplast remodeling during state transitions in Chlamydomonas reinhardtii as revealed by non-invasive techniques in vivo. Proc. Natl. Acad. Sci. U. S. A. 111:5042-5047. Tokutsu, R. Minagawa, J. 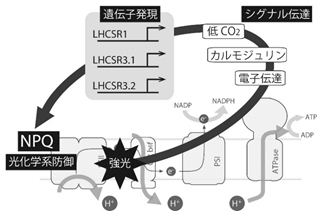 (2013) Energy-dissipative supercomplex of photosystem II associated with LHCSR3 in Chlamydomonas reinhardtii. Proc. Natl. Acad. Sci. U. S. A. 110: 10016-10021. Iwai, M., Yokono, M., Inada, N., Minagawa, J. (2010) Live-cell imaging of photosystem II antenna dissociation during state transitions. Proc. Natl Acad. Sci. U. S. A. 107:2337-2342. Nishimura, K., Kato, Y., Sakamoto, W. (2016) Chloroplast proteases: updates on proteolysis within and across suborganellar compartments. Plant Physiol. 171: 2280-2293. Kato, Y., Ozawa, S., Takahashi, Y., Sakamoto, W. (2015) D1 fragmentation in photosystem II repair caused by photo-damage of a two-step model. Photosynth. Res. 126: 409-416. Kuroda, H., Kodama, N., Sun, X.-Y., Ozawa, S., Takahashi, Y. (2014) Requirement for Asn298 on D1 protein for oxygen evolution: Analyses by exhaustive amino acid substitution in the green alga Chlamydomonas reinhardtii. Plant Cell Physiol. 55: 1266-1275. 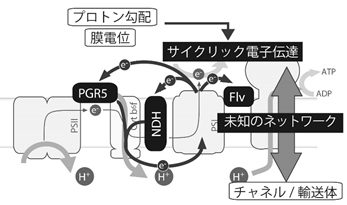 Yamamoto, H., Takahashi, S., Badger, M.R., Shikanai, T. (2016) Artificial remodeling of alternative electron flow by flavodiiron proteins in Arabidopsis. Nat. Plants 16012. 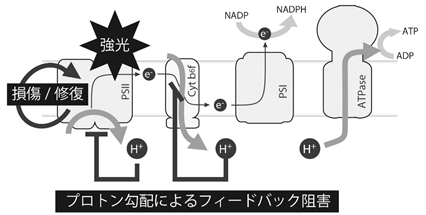 Wang, C., Yamamoto, H., Shikanai, T. (2015) Role of cyclic electron transport around photosystem I in regulating proton motive force. Biochim. Biophys. Acta 1847: 931-938. 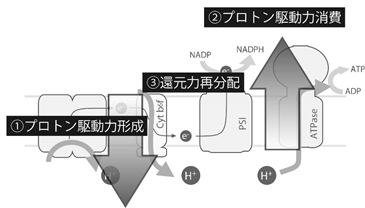 Yamori W., Makino A., Shikanai T. (2016) A physiological role of cyclic electron transport around photosystem I in sustaining photosynthesis under fluctuating light in rice. Scientific Reports 6, 20147. Yoshida K, Hisabori T. (2016) Two distinct redox cascades cooperatively regulate chloroplast functions and sustain plant viability. Proc Natl Acad Sci USA. 113(27):E3967-E3976. Ueki N, Ide T, Mochiji S, Kobayashi Y, Tokutsu R, Ohnishi N, Yamaguchi K, Shigenobu S, Tanaka K, Minagawa J, Hisabori T, Hirono M, Wakabayashi K. (2016) Eyespot-dependent determination of the phototactic sign in Chlamydomonas reinhardtii. PProc Natl Acad Sci USA. 113(19):5299-5304. Munekage, Y.N. (2016) Light harvesting and chloroplast electron transport in NADP-malic enzyme type C4 plants. Curr. Opin. Plant Biol. 31:9-15. Furumoto, T. (2016) Pyruvate transport systems in organelles: future directions in C4 biology research. Curr. Opin. Plant Biol. 31:143-148. Tanaka A., Ohno N., Nakajima K., Matsuda Y. 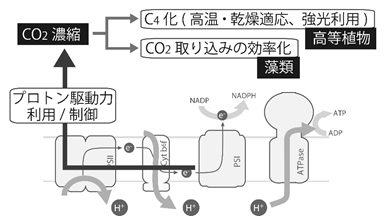 (2016) Light and CO2/cAMP signal crosstalk on the promoter elements of chloroplastic β-carbonic anhydrase genes in the marine diatom Phaeodactylum tricornutum. Plant Physiol 170: 1105-1116. Copyright © 新光合成：光エネルギー変換システムの再最適化. All rights reserved.